One morning after a particularly heavy bout of drinking and doing “terrible things,” Ignatius William Perrish wakes up with devil horns growing out of his head. But even stranger than that is the fact that the horns seem to have a magical power to tease out the most disturbing secret thoughts of the people he comes in contact with. Ig is confused and dismayed by this turn of events, not that life has been easy leading up to this transformation. It was only a year ago that Ig’s girlfriend Merrin was raped and murdered at the old foundry, and everyone is sure Ig committed the crime, though he wasn’t held as a suspect. With the sudden appearance of the Horns, Ig learns that even those whom he thought were closest to him are mistrustful of him. When his brother, Terry, sees the horns and finally admits he knows exactly who killed Merrin, Ig goes from the persecuted to the persecutor. Flashing backwards and forwards in time, we see Ig’s first meeting and subsequent love affair with Merrin, to the awful night when she was killed, and of course his struggles coming to terms with the new additions to his body that have a most unsettling effect on everyone around him. In this high tension horror/thriller Joe Hill proves that he is at the top of his game and gives us the most lovable demon you will ever come across. Joe Hill is an author I’ve heard a lot about. When his first book, Heart-Shaped Box, came out, the reviews and comments on it were phenomenal, and I knew it wouldn’t be something that I could easily miss. But as so often happens, life got in the way and time grew short and I didn’t pick it up. So when I was contacted by Trish from TLC Tours to review this book, I did a little happy dance and was very excited that I would soon be reading a book by this amazing author. And I was hooked from the first sentence; It was that good. I spent my time with this book in a fever of anticipation and had to sneak in a few pages everywhere I went, sometimes even when people were having a conversation with me! Ig is your typical nice guy, which makes it all the more strange that he suddenly has horns growing out of his head. When he first notices them, they are but small little red bumps that he thinks are a part of his hangover imagination. When he begins to notice that the horns make people say the most awful things on their mind, he’s not only frightened, but angered by what he hears. No one is safe from the power of the horns, and though Ig searches for comfort and normalcy in the people he comes in contact with, he finds none. The horns also have the power to make shocking secrets known to Ig whenever he touches someone’s skin, and these things also repulse and anger him. I relished Ig’s coming into contact with someone new throughout the whole story, because I knew there would be outrageous confessions and startled reactions, though I can imagine that Ig didn’t. When I was reading about all this I was wondering if the horns would eventually fully turn Ig into the demon he was beginning to resemble, but that never happened. Though he does a few malevolent things, Ig mostly keeps his honor and goodness intact, but it becomes ever harder once he discovers Merrin’s killer is one who has been lurking close by for years. I liked that the second part of the book takes us back to Ig’s childhood, where the restlessness of adolescence and his first meetings with Merrin and his close friend Lee take place. This section gave the book a really well rounded feel and made it easy to sympathize with the reality of Ig’s loss. Merrin was wonderful to read about, and she captured Ig’s heart instantly. Funny, wise and beautiful, it was easy to see just how young Ig fell in love with the girl. As time progresses and their relationship grows, I saw a more mature and considerate love replace the childish crush as Ig and Merrin both move onwards towards adulthood. All of these milder sections were shattered when, after an argument, Ig drives home alone and wakes up to find that Merrin has been raped and murdered at the abandoned foundry. Although he was never really a suspect, all those around him believe Ig was the culprit and that his family’s wealth helped him get away with murder. When Ig discovers the true murderer with the help of the horns, pardon the pun, but all hell breaks loose. Not only is Ig angry, he wants vengeance and he won’t let anything stop him. Tender and sweet Ig is slowly transforming into something altogether more violent and strange as time passes and more and more comes out in the open. Though he fights the influence of the horns, he can’t help but play the part that’s written for him, and become the thing that all men fear. The conclusion was unexpected but I felt it fit well with the rest of the story and I was pleased by the whole atmosphere and mood that Hill created. Though the true murderer was revealed early in the book, Hill has a way of flashing backwards and forward so convincingly that we got to see the whole thing, from the motive to the conclusion and the retribution. It was a masterful way to handle the whole thing and I was completely enthralled with all of it. I was also surprised at how funny this book could be. While it seems that this frightening affliction with the horns should be serious business, Hill really comes through with the funny moments and has great comic timing. After devouring this book in only a couple of days, I can now honestly say I have a total crush on Joe Hill. He can write like nobody’s business and knows just how to keep his audience in the palm of his hand. This book also contains a novella called The Devil on the Staircase, which was first published in Neil Gaiman and Al Sarrantonio’s collection called Stories. Hill explains between the two stories that they are very different endeavors, but both are representative of some of ideas he has cultivated on the subject of the devil.They were both very good, but as I said before, very different. Horns is an impressive novel and not one you should miss, and I have a feeling there will be a lot more Joe Hill in my future. 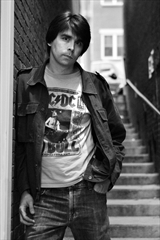 Joe Hill is the author of a previous novel, Heart-Shaped Box, a story collection, 20th Century Ghosts, and an occasional comic series, Locke & Key. He is a two-time winner of the Bram Stoker Award and a past recipient of the Ray Bradbury Fellowship. His stories have appeared in a variety of journals and Year’s Best collections. This sounds intriguing - not usually a genre I read but may be worthwhile. I don't think I've read a single bad thing about this book! What an incredibly creative and unique story - it almost seems like it could be dangerously close to being considered as not a serious book, at all but it sounds like instead it is quite an intense and thought-provoking (dare I say) study of being honest, with a dash of humor sprinkled through it. Sounds like my kinda book and one I need to pick up soon! I've not heard of this book before and now I'm wondering where the heck I've been to see so many fantastic bloggers raving about this?! This sounds pretty bizarre! Great review! Oooh he is kinda cute. And like you, Heart-Shaped Box was one I really REALLY wanted to read and it just passed me by. Huh. Well, dammit I'm just going to order it from the library (of course will read after April 1st) and then move onto this one. Nice job twisting my arm! Ha! OMG they had them both on audio. I'm going to faint. Very nice review. A promising read. I love the way Ig slowly evolves over the course of the book. I would imagine it was somewhat unsettling and sad to watch him morph from such a likeable man to something violent and bent on vengenance. Your observation about him seeking comfort and normalcy with those he meets and finding none, made me think of the plight and yearning of Frankenstein's monster. The plot sounds really interesting. I will have to check this one out. Great review! Wow, Zibilee, what a glowing review! The book sounds extremely engaging. I'm glad you enjoyed it so much. I will keep an eye out for it. Although I don't read that many thrillers, this one sounds exceptional. This sounds awesome! I really loved Heart-Shaped Box and I'm looking forward to reading Joe Hill again. Aah, how I love literary crushes ... and Joe Hill certainly seems to be pretty fantastic. Wow! This sounds excellent! I haven't read anything by Hill before but I might need to start now! I read Heart-Shaped Box and it was pretty good. You do know he is Stephen King's son, right? I guess the ability to tell scary, supernatural stories runs in the family. Yup, Jenners, I totally knew. I didn't mention it in my review because I didn't want to make it seem like he was riding on his dad's coattails, and I wanted readers to really be able to see that although Hill's books share the same supernatural elements as King's, he stands alone as an author. You know I tried reading his first book and just couldn't get into it at all. Not sure I would even give this one a chance but maybe one day since you liked it. I don't even know what to think about this book. It sounds crazy and intense - I'll have to keep it in mind!